AUSTRALIAN TERRITORIES : Cocos (Keeling) Islands. 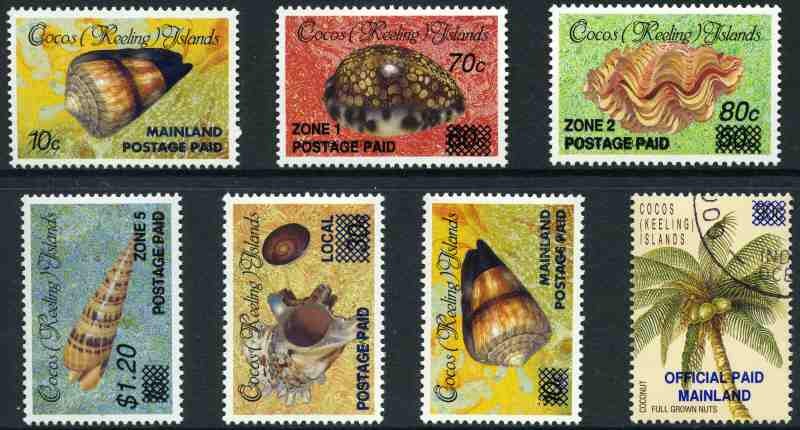 1990-91 Provisional overprints set of 7 MUH, including 90¢ Coconut Official CTO with gum. Retail $295.00. 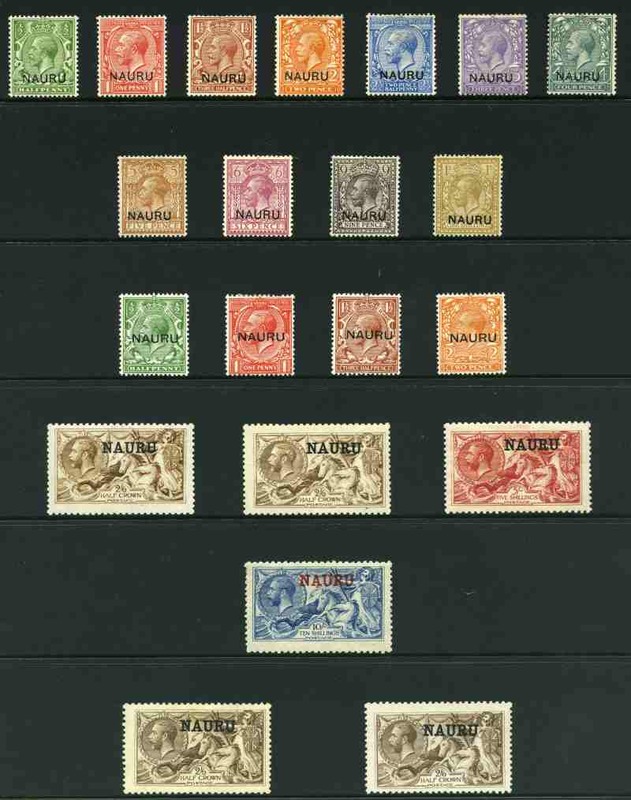 Collection of MUH, MLH and FU stamps from 1916 to 1996 including 1916-23 KGV O/P at base set excluding 2d Die II MLH, 1919 2/6 Pale Brown Bradbury Wilkinson print Seahorse MLH, 1923 KGV O/P at centre set MLH, 1937-48 Smooth Paper Ships set MLH (2/6 VFU) and complete MUH from 1935 Silver Jubilee set (MLH) to 1996 Return from Truk set including additional FU issues to 1979. 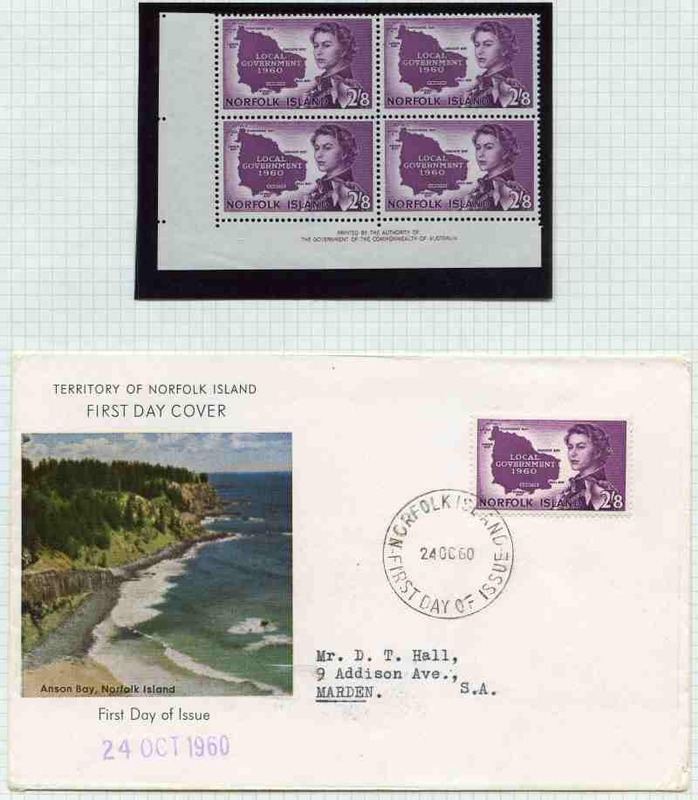 Also 1935 Silver Jubilee set on registered cover, collection of FDC's from 1966 to 1996 and range of presentation packs, plue small selection of Marshall Islands Yachts cancelled Nauru and N.W.P.I. 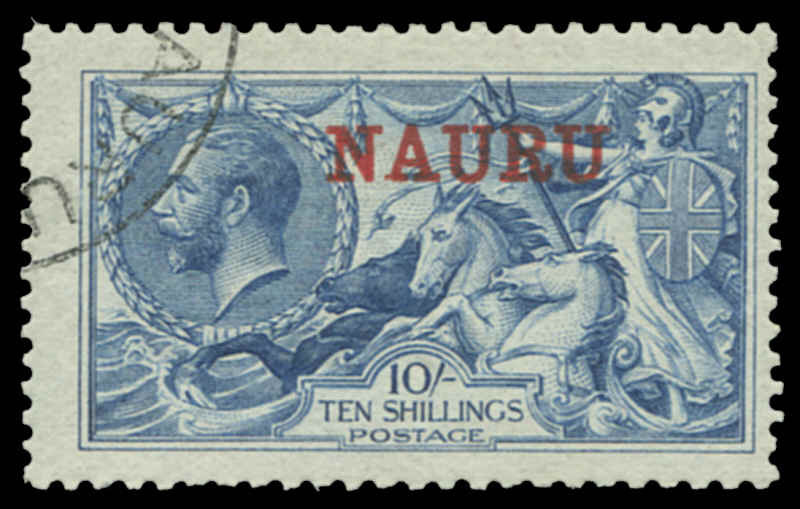 issues cancelled Nauru or Pleasant Island, Nauru. Face value of MUH Decimal issues $362.00. 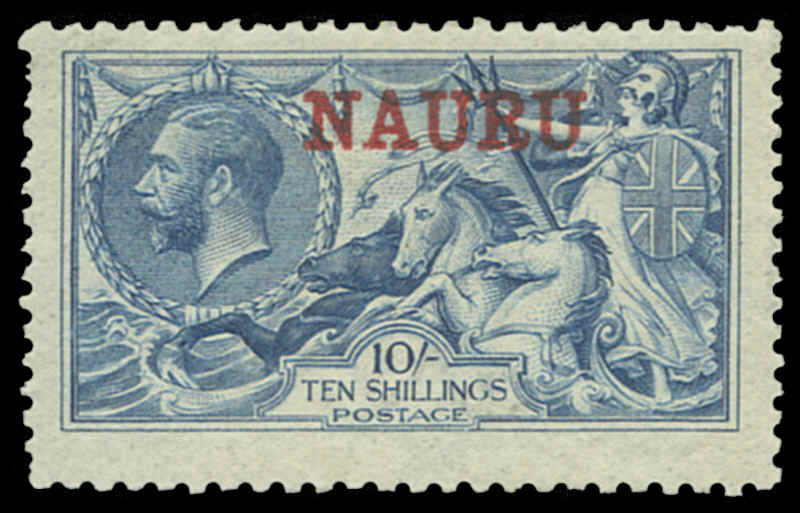 1916-23 KGV O/P at base set excluding 2d Die II only, 1916 2/6 Yellow-Brown, 2/6 Brown, 5/- Carmine and 10/- Pale Blue De La Rue print Seahorse set, 1919 2/6 Chocolate-Brown Bradbury Wilkinson print Seahorse (2), 1923 KGV O/P at centre set of 4, 1924-34 Rough Paper Ships set and 1937-48 Smooth Paper Ships set MLH. 10/- Seahorse with few blunt perfs. Odd heavy hinge and minor fault. Sg 1-4, 6-16, 20-24, 26A-39A and 26B-39B. 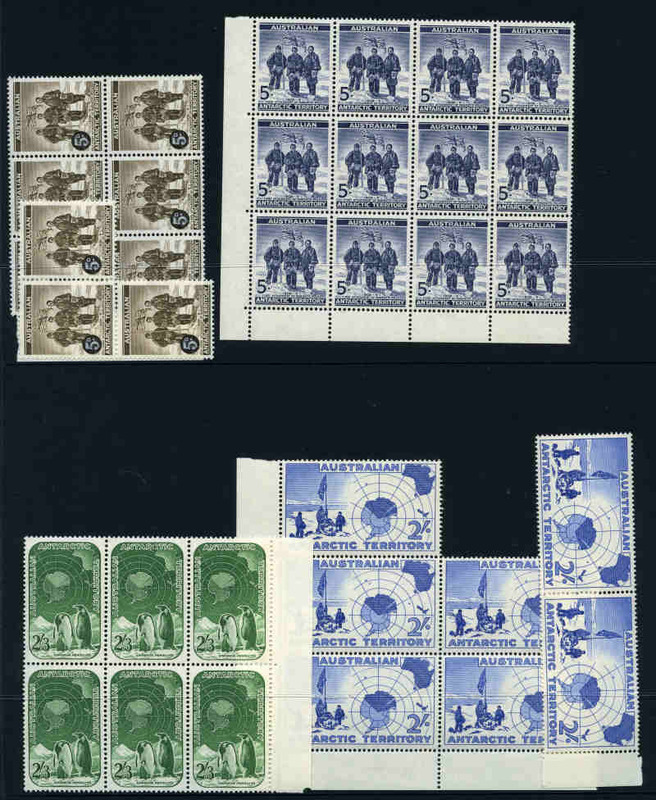 1916-23 KGV O/P at base set excluding 2d Die II only, 1916 De La Rue print Seahorse set (5/- on piece), 1923 KGV O/P at centre set of 4, 1924-34 Rough Paper Ships set and 1937-48 Smooth Paper Ships set fine used and reasonably centered. Odd blunt perf hardly detracts. Sg 1-4, 6-16, 21-23, 26A-39A and 26B-39B. 1924-34 Rough Paper Ships set excluding ½d and 2d values CTO with gum. Usual odd short perf and varied centering. Sg 27A, 28A and 30A-39A. Catalogue Value £385.00. 1924 Rough Paper Ships set fine used on folded cover front. (Folds are clear of the stamps). Sg 26A-39A. Catalogue Value £400.00. 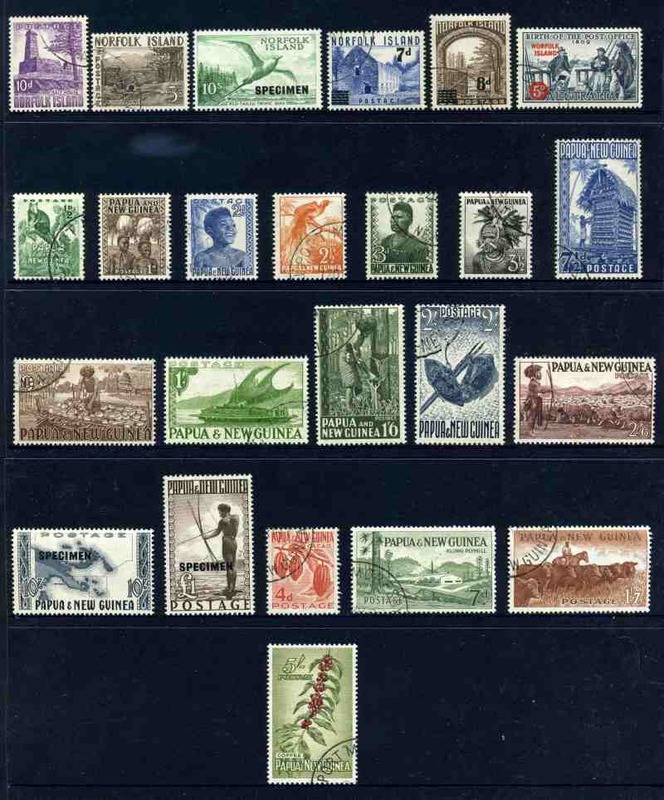 Largely complete collection from 1972 25¢ South Pacific Commission to 1988 Independence set, comprising up to 100 sets or more of each in various size sheets including 1973 Co-operative Society (100), 1974 UPU (25), 1978-79 Definitive set (100), 1983 Christmas set (1,000), plus 1974 UPU M/S (40), 1979 Rowland Hill M/S (100), 1980 Phosphate M/S (100), 1981 Fishing M/S (100), 1982 Scouts M/S (90), 1982 Anpex M/S (100) and 1987 World Post Day M/S (100) MUH. Face Value $8,431.60. 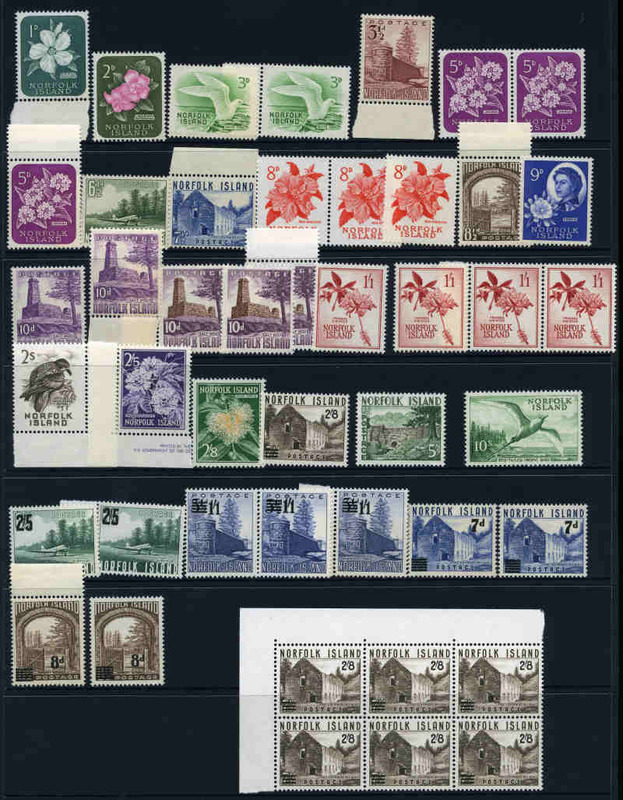 Collection of mint stamps from 1947 to 1965, including 1947-59 Ball Bay set of 14, 1956 2d White Paper Ball Bay, 1953 Definitive set and 1958 Surcharge set, all in imprint blocks of 4, lightly hinged on top units, with lower units MUH, 1960 2/8 Local Government imprint block of 4 MUH and more. 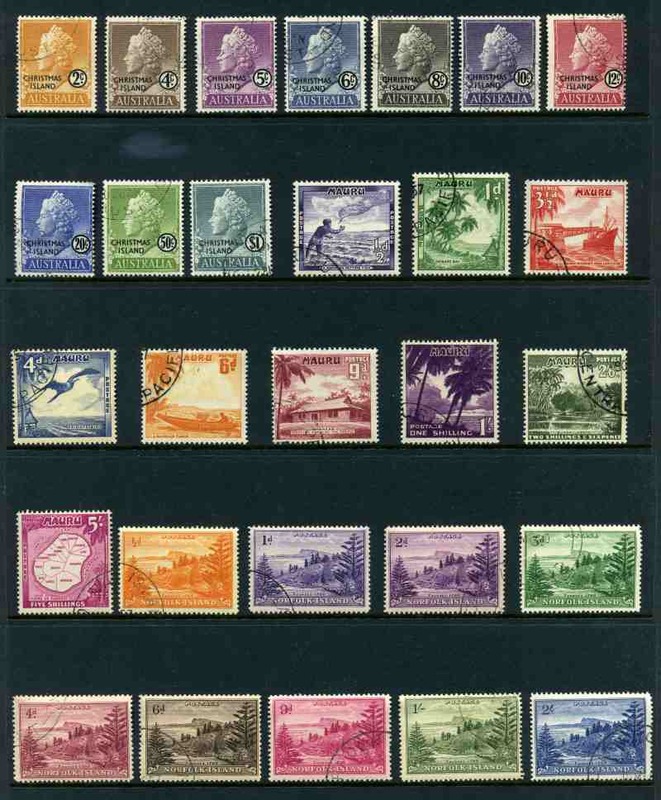 Also 1953 Definitive set FU, plus 4 FDC's including 1960 2/8 Local Government. 1972 7¢ Christmas (200), 1972 12¢ Church (100), 1973 35¢ Cook Bicentenary (100), 1973 Christmas (100), 1974 Royal Visit (50), 1975 Christmas (50), 1975 Resolution (50), 1976 American Revolution (100), 1977 Christmas (50), 1978 Girl Guides (100), 1978 80¢ Year of the Child (100), 1979 Christmas (20), 1981 Pitcairn Islanders (100), 1981 Royal Wedding (100), 1981 Silvereye (100), 1982 Philip and Nepean Islands (100), 1983 Manned Flight (200), 1983 Christmas (200), 1984 Boobook Owl (20), 1984 Ausipex (100), 1987 Parrot (100), 1993 Tourism (10) and 1994 Sea Birds (10), all in MUH sheets, plus 1979 Rowland Hill M/S (75), 1979 Christmas M/S (100), 1984 Ausipex M/S (100), 1986 Marine Life M/S (100) and 1989 Mutiny on the Bounty, 1989 Self-Government, 1989 $1.00 Red Cross, 1989 Christmas, 1989 Radio, 1990 History of Norfolk Islanders, 1990 Wreck of H.M.S. Sirius, 1993 Emergency Services and 1993 Nudibranches sets in blocks of 10 MUH. Face Value $2,983.15. Collection of hundreds of MUH, MLH and CTO issues from 1960 to 1984, on album pages and sorted in packets, including numerous sets and handy range of early issues, with varying duplication. Also small range of MUH British Commonwealth issues sorted in packets. Mainly circa 1950's. 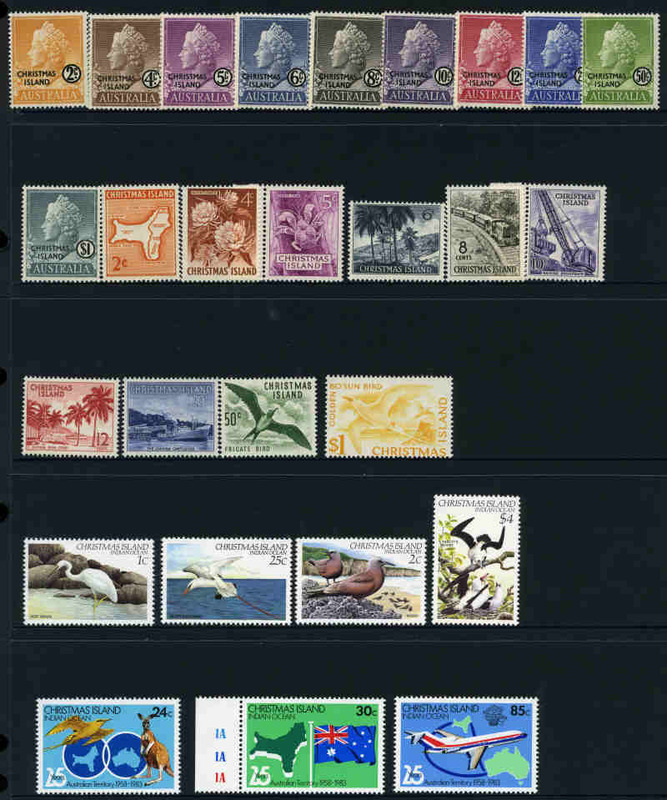 Collection of mostly MUH stamps from 1947 to 1985, including Australian Antarctic Territory 1966 Definitive set, Christmas Island 1958 QEII Definitive set, 1968-70 Fish set, Cocos (Keeling) Island 1963 Definitive set and Norfolk Is 1956 2d White Paper Ball Bay (MH), 1953 Definitive set, 1960-62 Definitive set and 1974 UPU M/S, plus Pitcairn Island collection from 1940-51 KGVI Definitive set to 1979 Christmas, including 1949 Royal Wedding set MLH (light toning) on annotated album pages in loose leaf binder. Some early issues MLH only. 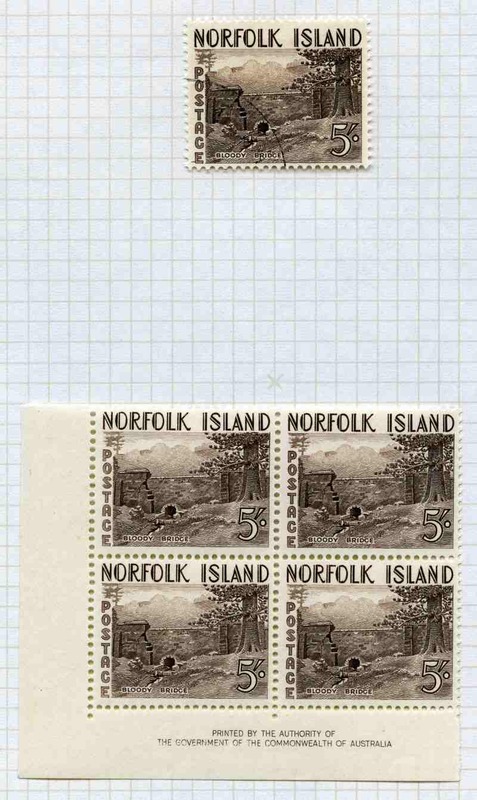 Christmas Island complete from 1958 QEII Definitive set to 1978 Christmas M/S, Cocos (Keeling) Islands complete from 1963 Definitive set including imprint blocks of 4 set to 1976 Ships set and Norfolk Island complete from 1947-59 Ball Bay set of 14 inc White Paper set to 1979 Death of Cook set both MLH and fine used in loose leaf album. Includes some additional items and many MUH. 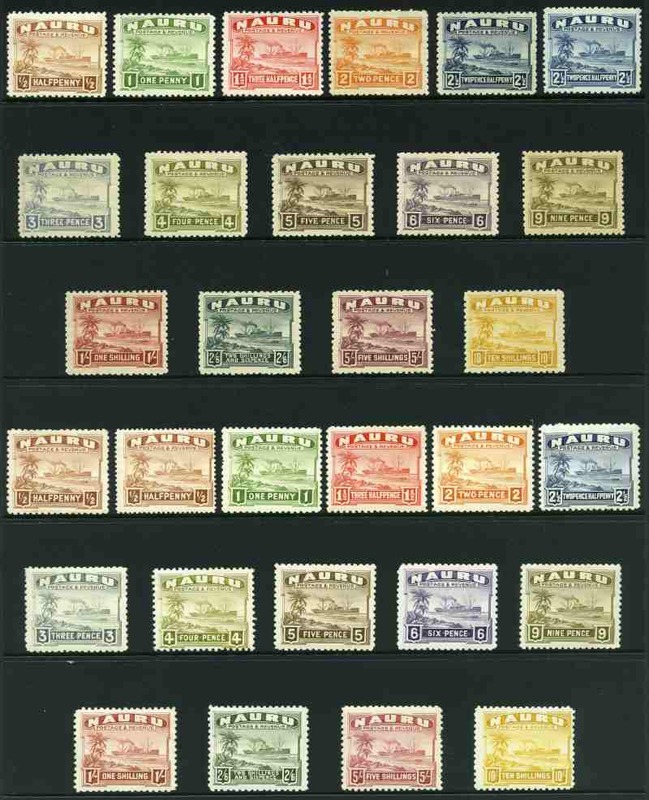 Accumulation of many hundreds of MUH stamps from Australian Antarctic Territory, Christmas Island, Nauru and Norfolk Island, with a range of periods from 1937 to 1980's represented, including a selection of useful items, on Hagner sheets. Some light duplication. High retail value. 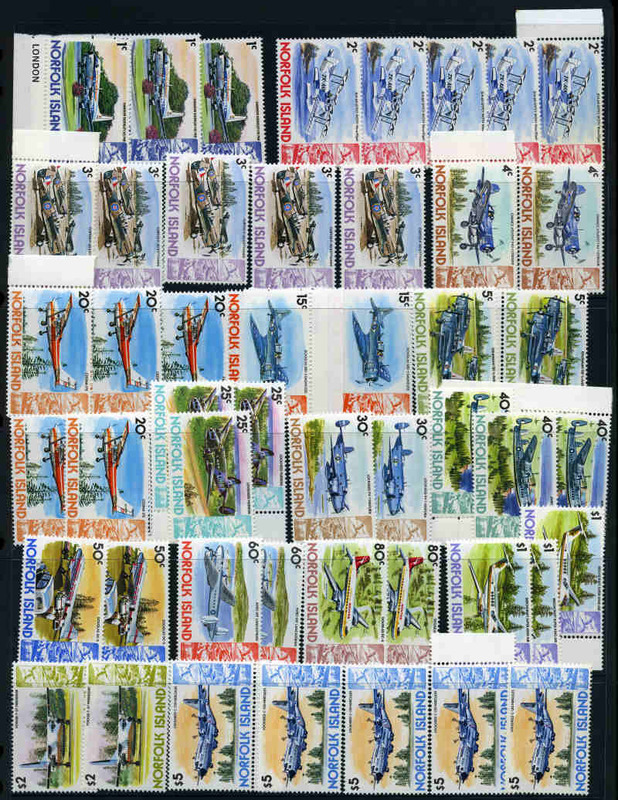 Australian Antarctic Territory complete from 1957 2/- Map to 1992 Wildlife set, Christmas Island from 1958 QEII Definitive set to 1992 Christmas strip of 5, Cocos (Keeling) Islands from 1963 Definitive set to 1991 Christmas set including 1990-91 Provisional overprints set of 7, Nauru from 1935 Silver Jubilee set to 1988 Christmas set and Norfolk Island from 1947-59 Ball Bay set of 14 to 1988 Buildings of the Convict Era set including 1961 10/- Bird O/P 13½mm Specimen MUH on Seven Seas pages in 3 binders. Odd early item MLH. Face value of Decimal issues $651.00. 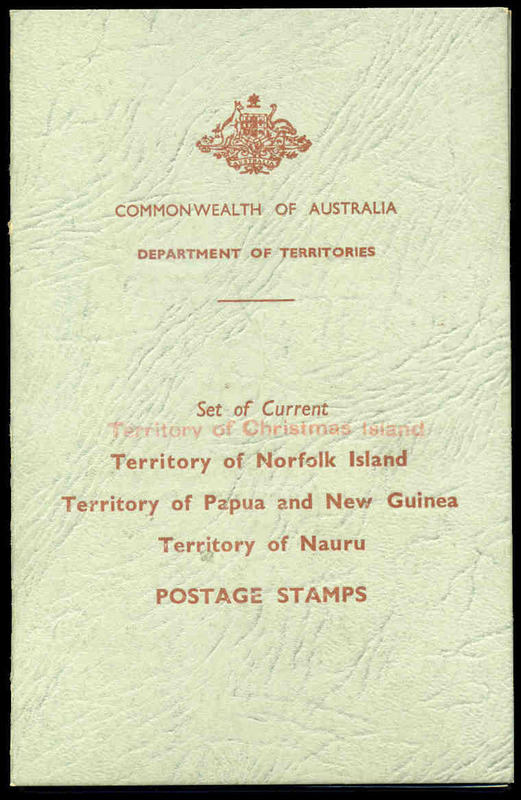 Australian Antarctic Territory complete from 1957 2/- Map to 1986 36¢ Antarctic Treaty, Christmas Island from 1958 QEII Definitive set to 1988 Christmas set, Cocos (Keeling) Islands from 1963 Definitive set to 1988 Christmas set, Nauru from 1935 Silver Jubilee set to 1985 Audubon set and Norfolk Island from 1947-59 Ball Bay set of 14 to 1985 Christmas set fine used, mainly on Seven Seas pages in 2 binders. 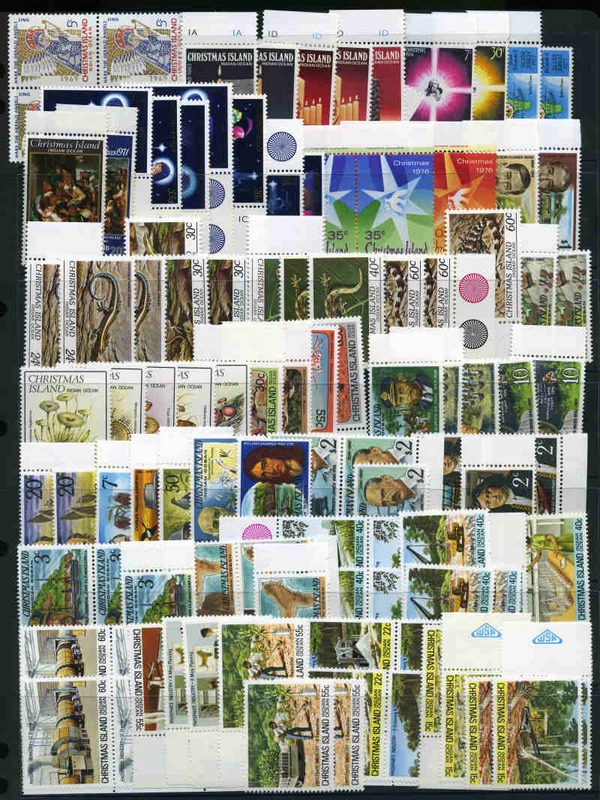 Collection of many hundreds of mostly MLH stamps from 1947 to 1988, with some FU and CTO, from Christmas Island, Cocos (Keeling) Islands, Nauru, Norfolk Island and Papua New Guinea. Numerous useful items and high face value. 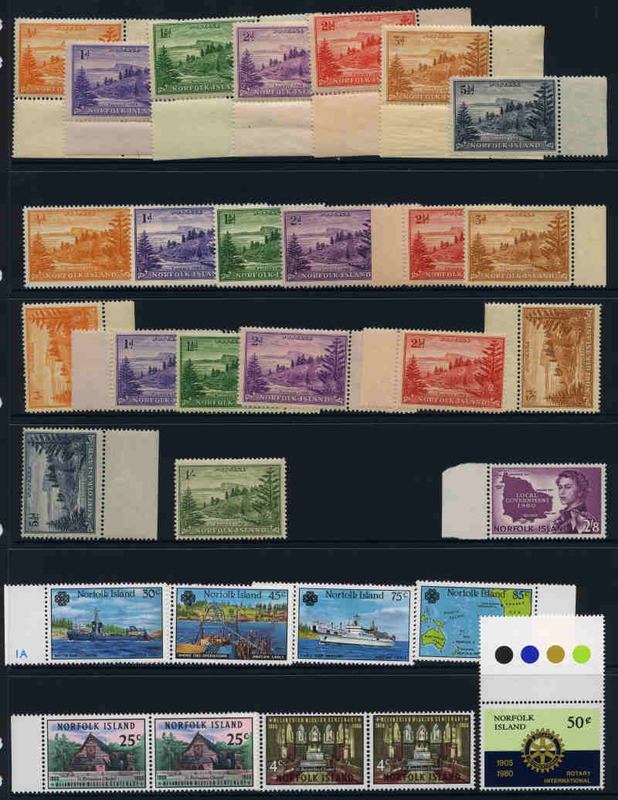 Christmas Island, Cocos (Keeling) Islands, Nauru and Norfolk Island accumulation of MUH stamps and miniature sheets from 1966 to 2005 including numerous sets and duplicates. Face Value $1,775.00. Post Office presentation folder containing various CTO and MUH issues including Nauru 1954 Definitive set CTO with gum, Norfolk Island 1947 Ball Bay set, 1953 Definitive set and 1956 Pitcairn Islanders set CTO with gum and Papua New Guinea 1952 Definitive set (10/- Map and £1 Fisherman O/P Specimen MUH) and 1957 Surcharge set CTO with gum. Post Office presentation folder containing various CTO and MUH issues including Christmas Island 1958 QEII Definitive set CTO with gum, Nauru 1954 Definitive set CTO with gum, Norfolk Island 1953 5/- Bloody Bridge CTO with gum, 1961 10/- Bird O/P 15½mm Specimen at lower right and Papua New Guinea 1952 Definitive set (10/- Map and £1 Fisherman O/P Specimen MUH) and 1958 1/7 Cattle CTO with gum. 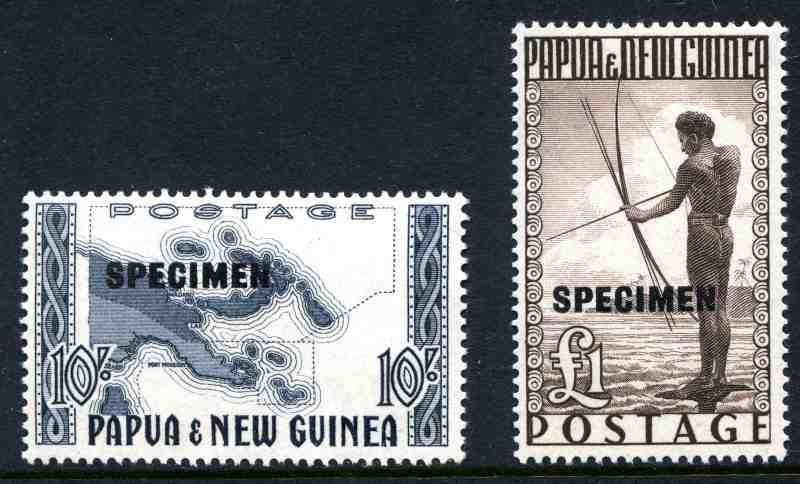 Post Office presentation folder containing various CTO and MUH issues including Christmas Island 1963 Definitive set CTO with gum, Nauru 1954 Definitive set CTO with gum, Norfolk Island 1961 10/- Bird O/P 13½mm Specimen MUH and Papua New Guinea 1963 £1 QEII O/P 13½mm Specimen MUH and 1964 10/- Bird O/P Specimen MUH. 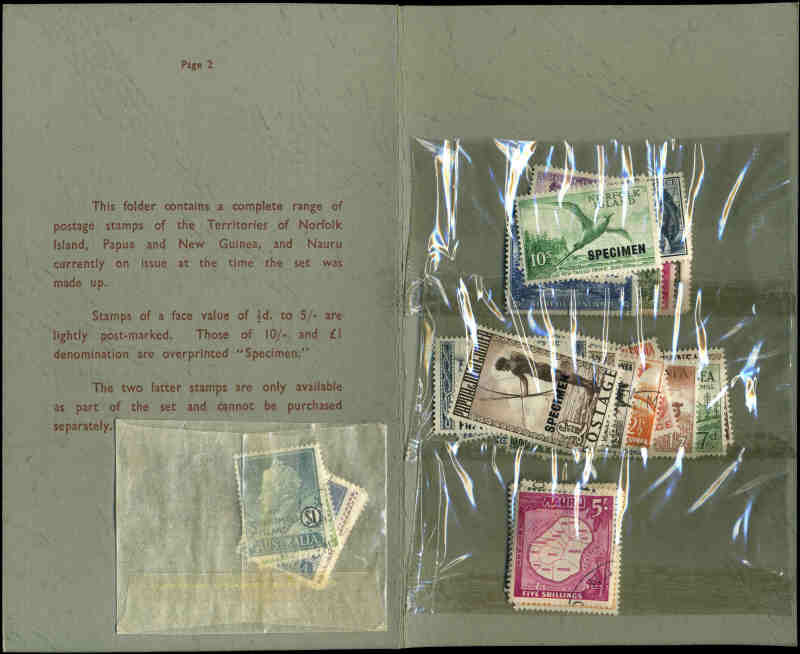 Post Office presentation folder containing various CTO and MUH issues including Christmas Island 1958 QEII Definitive set CTO with gum, Nauru 1954 Definitive set CTO with gum, Norfolk Island 1961 10/- Bird O/P 15½mm Specimen at lower right and Papua New Guinea 1963 10/- Rabaul and £1 QEII O/P 15½mm Specimen MUH. 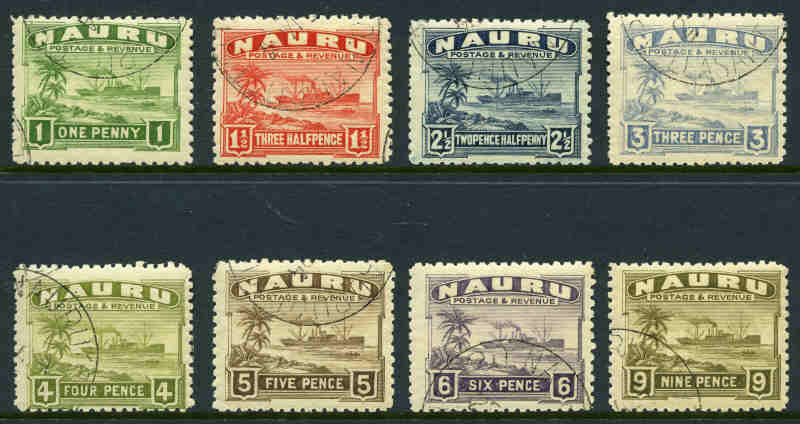 Largely complete collection of Christmas Island from 1958 QEII Definitive set to 1992 Shells set, Cocos (Keeling) Islands from 1963 Definitive set to 1992 Christmas set, Nauru from 1954 Definitive set to 1982 Christmas set, Norfolk Island from 1947-59 Ball Bay set of 14 to 1996 Christmas set and Papua New Guinea from 1952-58 Definitive set to 1992 Flowering Trees set, many issues represented both MUH and VFU. Some light duplication and few early sets MLH. Face value of MUH Decimal Territory issues $813.00 and Decimal PNG issues K213.00. 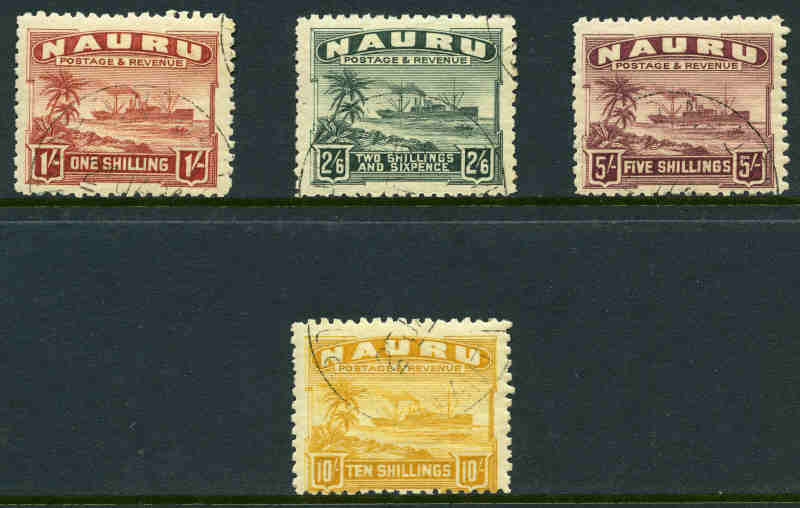 Australian Antarctic Territory, Christmas Island, Cocos (Keeling) Islands, Nauru and Norfolk Island collection of MUH and MLH stamps from 1956 to 1993 (Face value $742.00) and Papua New Guinea from 1952 to 1986 (Face value K111.00) on Seven Seas pages in 3 binders, plus range of duplicates in stockbook. Also Pitcairn Islands largely complete mint collection from 1940-51 KGVI Definitive set to 1992 Sharks set including 1949 Royal Wedding set in Collecta album. Majority of issues from 1970 onwards MUH. 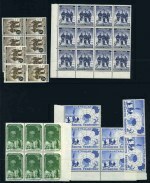 Collection of many hundreds of mostly MUH stamps from early to modern on Seven Seas album pages and Hagner sheets in 4 binders. 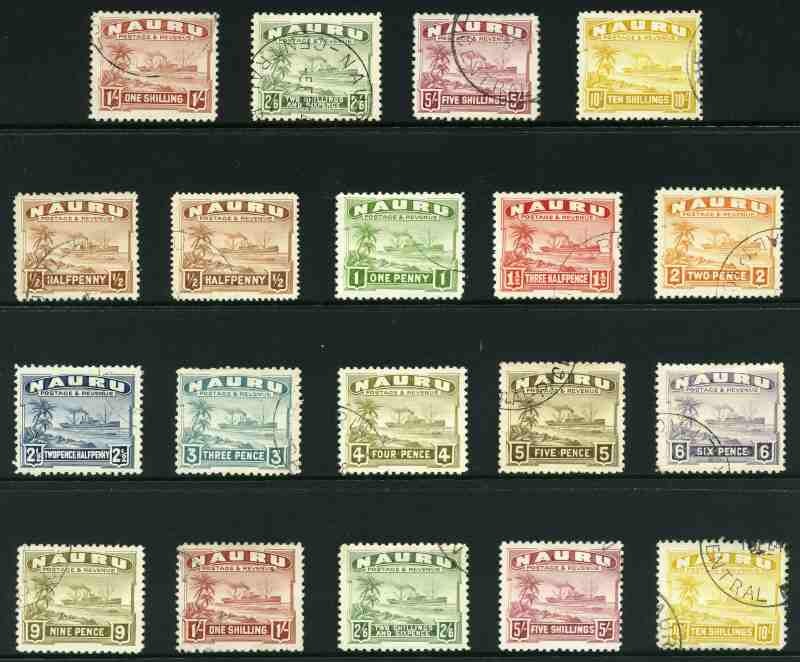 Numerous sets and some duplication, plus small range of Papua issues. Odd fault. Australian Territories and Pacific Is. 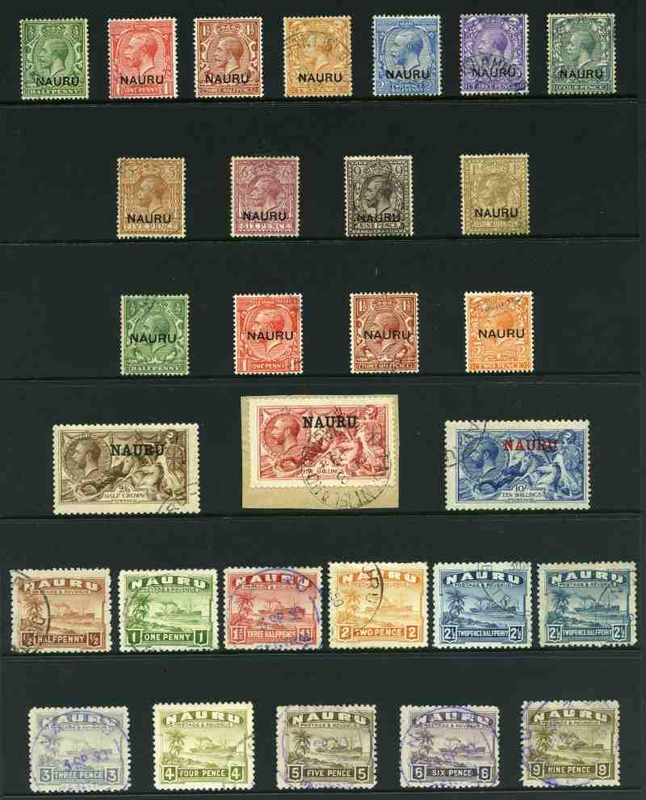 Accumulation of MUH stamps from 1963 to 1985 comprising Christmas Island, Cocos (Keeling) Island, Nauru, Norfolk Island, New Zealand, Fiji, Kiribati, Samoa, Gilbert Islands, Aitutaki, Cook Islands, Penrhyn, Niue, Papua New Guinea, Solomon Islands, Pitcairn Islands, Tokelau and Tuvalu plus small range of St. Vincent and Montserrat, in 6 large Chinese stockbooks. Includes many sets and some duplication. Total Face Value A$1,142.00.